Williamstown Town Hall is located at 31 North Street, Williamstown MA 01267; phone: 413-458-3500. Williamstown was incorporated in 1765 and named in honor of Colonel Ephraim Williams, the founder of Williams College. 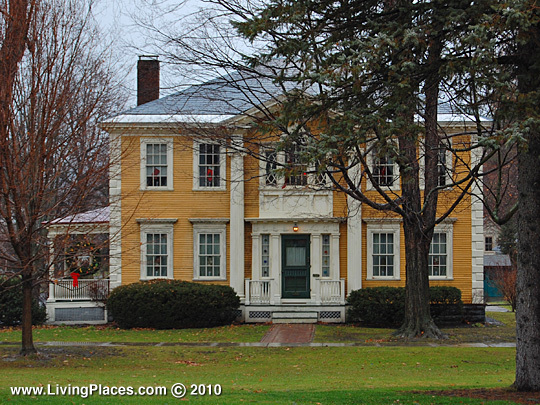 Captain Nehemah Smedley, one of the first five proprietors, born in Litchfield, Connecticut, settled here sometime between 1750 and 1760. He was driven away by the French and Indians during the French war, but soon returned, as the captain of a military company, and built a block house for the defense of the town. He located a farm and built a house in 1776. He left his house before its completion and joined the Continental Army in 1776, remarking that he "would know who owned his house before he finished it," and led his command in the battle of Bennington. After the war he resumed a life of farming. Colonel Benjamin Simonds came to Williamstown from Northampton, Massachusetts before the Revolutionary War and was one of the earliest and most influential citizens in town. He held the office of colonel and led his regiment in the battle of Bennington, which included all the forces from Berkshire county. After the war he returned to farming. Benjamin F. Mather came to Williamstown from Pownal, VT and formed a co-partnership with Orrin Kellog as general merchants. The firm continued until 1836 when Mr. Mather bought Mr. Kellog's business interest. James Meacham came to Williamstown from Salem, Mississippi in the autumn of 1762 and settled as a farmer. Mr. Joseph Talmadge, born in Wales, came to Williamstown at a very early date, when there were only a few families in town. In 1880 the town had a population of about 3,400. In 1883 it employed 5 male and 15 female teachers at an average monthly salary of $43.89 for the men, and $29.36 for the women. Hamilton Child, Gazetteer of Berkshire County, Mass., 1725-1885. The Journal Office, Syracuse, 1885.